Summary: A new study reveals people respond to stimuli in another person’s peripersonal space as they could their own. Three types of experimental stimuli were used, tactile only (a), visuotactile (b), and visual only (c). 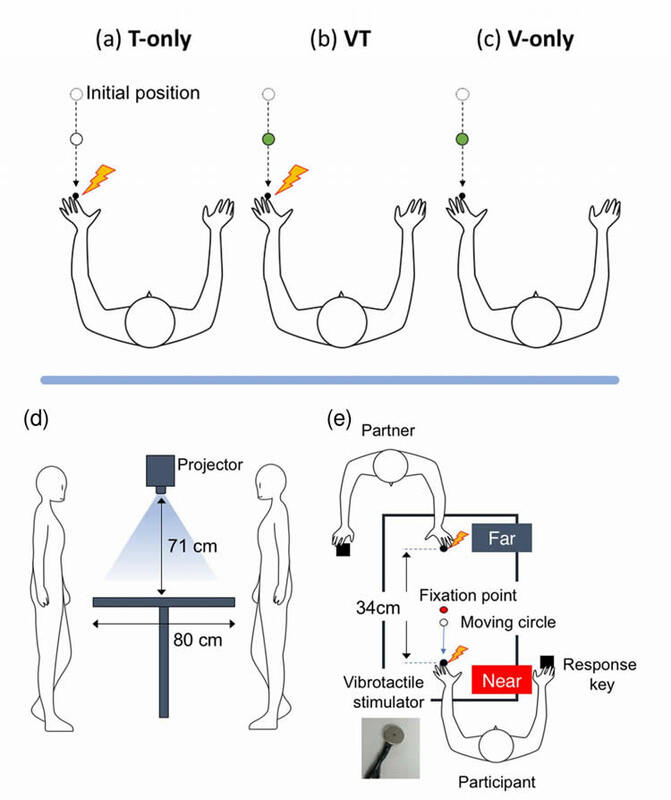 Participants and partners (when needed) stood opposite each other and placed their heads against an apparatus to keep their viewing distance constant (d). A projector displayed an image of the fixation point and a moving circle on the surface of a table (d & e). Participants had a vibrotactile stimulator attached to their index finger and were instructed to press the response key when they detected any of the stimuli (e). NeuroscienceNews.com image is credited to Dr. Wataru Teramoto. Funding: Funding provided by Japan Society for the Promotion of Science. Image Source: NeuroscienceNews.com image is credited to Dr. Wataru Teramoto. Original Research: Open access research for “A behavioral approach to shared mapping of peripersonal space between oneself and others” by Wataru Teramoto in Scientific Reports. Published April 33 2018. Kumamoto University “Your Brain Considers Other People’s Personal Space as Your Own.” NeuroscienceNews. NeuroscienceNews, 7 June 2018. Kumamoto University “Your Brain Considers Other People’s Personal Space as Your Own.” http://neurosciencenews.com/personal-space-9283/ (accessed June 7, 2018). Recent physiological studies have showed that some visuotactile brain areas respond to other’s peripersonal spaces (PPS) as they would their own. This study investigates this PPS remapping phenomenon in terms of human behavior. Participants placed their left hands on a tabletop screen where visual stimuli were projected. A vibrotactile stimulator was attached to the tip of their index finger. While a white disk approached or receded from the hand in the participant’s near or far space, the participant was instructed to quickly detect a target (vibrotactile stimulation, change in the moving disk’s color or both). When performing this task alone, the participants exhibited shorter detection times when the disk approached the hand in their near space. In contrast, when performing the task with a partner across the table, the participants exhibited shorter detection times both when the disk approached their own hand in their near space and when it approached the partner’s hand in the partner’s near space but the participants’ far space. This phenomenon was also observed when the body parts from which the visual stimuli approached/receded differed between the participant and partner. These results suggest that humans can share PPS representations and/or body-derived attention/arousal mechanisms with others.